Are you looking for professional bus charter experience in Michigan? Charter Everything is here to provide you with a simple solution to all your bus travel needs. We are the leading charter bus and minibus rental company in Michigan. We provide the best transportation services for all types of events & special occasions like school trips, weddings, corporate events, excursion trips, sporting events and private events. Whatever your travel requirements are, we take care of them with our premium charter bus service. We make sure that your journey is seamless and comfortable while traveling with us. With its diverse landscape and engaging history, Michigan has a lot of attractions for tourists. This Midwestern US state is a paradise for nature lovers, having its borders with the Great Lakes and a large number of inland lakes. Explore the legendary city of Detroit popularly known for its auto market industry in our luxurious charter buses. Enjoy a glimpses of the coastal habitats and freshwater dunes. Get to know about the history of Michigan by visiting a few historical museums. Get immersed in the beauty of Mackinac Island while traveling in our state of the art charter buses. Get in touch with our travel team and we will assist you in planning your trip to Michigan with a mini bus or luxury charter bus. We provide you with an ideal travel package to accordate all your bus rental needs. You can explore our exclusive wide range of buses in our fleet and choose the one that best suits your group size. Hire our charter bus services and we will make your trip to Michigan perfect for you and your passengers. Are you planning a corporate trip with your employees? 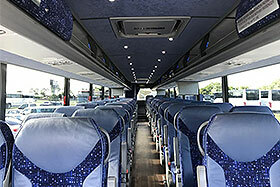 Hire a personalized charter bus or minibus from Charter Everything. Whether it is a corporate outing or a business event in Michigan, we have the ideal transportation solutions tailored according to your travel needs. With over 25 years experience serving all types of corporate clients for business events, we are proud to be the ultimate charter bus rental service provider to many fortune 500 companies in Michigan. Our chauffeurs are highly professional and punctual so that you can arrive ontime to your corporate event. Our travel experts are available 24×7 to guide you in the best possible ways of planning the perfect itinerary for your trip. Whether you need to travel from the airport to your hotel or from the hotel to the place of your business meeting, we have everything covered for you. You do not need to worry about parking or traffic as our drivers are experts in managing all of these task. We’ll take you to the most popular tourist attractions of Michigan so that you can have a wonderful time with your colleagues while traveling in comfort with a luxury charter bus or minibus rental. We are the most reliable and affordable transportation provider in the Michigan area. We ensure the safety of our travelers by following high safety standards in our fully insured vehicles. With the assistance of our travel experts, you can plan the transportation of your mega-events in a seamless manner. We make sure to provide your guests with a hassle-free travel experience. Let us handle the transportation while you prepare for your event. We offer a large variety of vehicles in our dynamic fleet. We have 56 passenger luxury charter buses and other standard vehicles with different seating capacities for groups of all sizes. You can choose our 20-38 passenger minibuses if you are traveling with a smaller group. 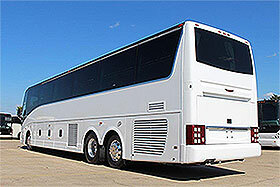 For large groups, we have charter buses that can easily accommodate 49 passengers up to 61 passengers. Our vehicles are properly maintained on a regular basis for excellent performance on the roads. Our drivers are certified and licensed to ensure that you are in safe hands. Weddings are always special, whether it’s your wedding or your near and dear family and friends. 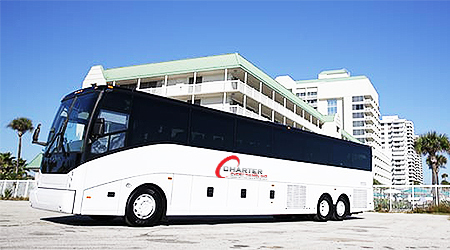 Stay relaxed and stress-free about transportation by hiring a charter bus rental services from Charter Everything. Travel in style and comfort to the wedding venue with your friends and family in our luxury charter buses or minibus rentals. We make sure to provide all types of facilities on our buses to meet the travel needs of your guests. If you need to travel across the states to attend a wedding, Charter Everything is the company which you can rely upon. Arrive at the wedding in a hassle-free manner in our luxury charter buses to enjoy the auspicious occasion to the fullest. We provide pickup and dropoff facilities for your guests to and from the airports as well as the hotels. Whether you are a die-hard fan of your favorite team, or you are a member of a sports team, we provide you premium transportation services to take you to the sporting event. Go support your team and enjoy the sporting event to the maximum by traveling in our charter buses or mini buses. Experience the best travel experience with your team or group of friends while preparing for a mega sporting event. Our deluxe charter buses have sufficient storage space in the lower luggage compartments to carry all the sports equipment of your team. Our buses are equipped with the latest technology and features like reclining seats for comfort, audio & video system for entertainment, and internet Wi-Fi for connectivity and outlets to keep you charged at all times..
You can arrive our travel experts to plan your trip according to the schedule of your sporting event. Select the bus of your choice from our fleet according to the size of your group. We will provide you with the most affordable quote for your selected travel package. We offer top quality transportation services at the most affordable prices. Our prices are highly competitive and unmatched in the travel industry. We do not have hidden charges and you only need to pay the price which is mentioned in the quote, which is inclusive of all kinds of taxes, tolls and current fuel charges. 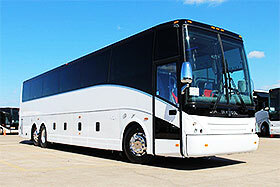 We make sure that our bus rental service fits any budget with very cost effective prices.